It is the goal of our partnershipwith the DEA Educational Foundation to provide information and education about the dangers, misuse and abuse of prescription drugs and over-the-counter medicines in an effort to save our children. In 2007, 6.9 million Americans abused prescription drugs, compared with 3.8 million in 2000—an 82% in increase in just seven years. And it continues to increase. On-line and internet pharmacies add to the list of sources where young people obtain drugs. 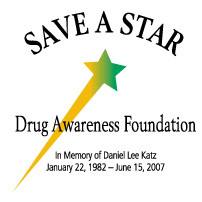 SAVE A STAR Drug Awareness Foundation, in partnership with the DEA Educational Foundation, is bringing to life the Traveling Exhibit, "RX Factor". 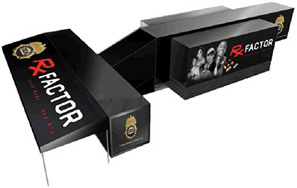 To watch a video about the Rx Factor Traveling Exhibit, click here. Data shows that the Rx Factor, on the road will have more than twenty million visual impressions, and that more than 80% of those viewers have one to three children. The RxFactor would appear at a range of schools and "critical mass" events across the country, such as state fairs, festivals and sporting venues. Likewise, the dynamic environment of the Rx Factor would be able to serve audiences such as inner-city youth, rural Americans, and the elderly, as well as audiences that would not travel to science centers or museums.